Daily Deal, Wednesday, March 12, 2008: Earlier this week Walletpopper Gary Sattler wrote about Menard's home center's occasional bag sales, in which customers received a percentage off anything that they could fit in the prmotional grocery bag that the store provided. Coincidently, with my Sunday paper this week came a grocery bag from Office Max for the same purpose. 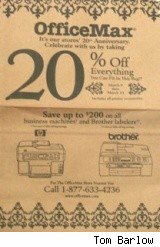 The bag sale, celebrating the chain's 20th anniversary, offers a hefty 20% off whatever I choose to put in the bag, excluding some logical items such as gift cards, phone cards and special orders. Items already on sale are not further discounted. The sale runs through March 15th. Check last Sunday's paper to see if the sale is happening in your area. If you've had your eye on an electronic device that doesn't seem to go on sale, or just want to stock up on pens and envelopes, this sale might be just the ticket.